Clinical depression has been described as the common cold of mental illnesses. At times in my ministry I have wondered: who doesn’t suffer with depression or hasn’t at some point or other? The more open we are about discussing it, the less stigma we attach to it, the more we discover how common this ailment is. Unfortunately, its prevalence does not mitigate its pain. The pain is not eased by those who see the ailment in a simplistic way as merely a spiritual problem with a spiritual cure. Even today there are Reformed believers who want to maintain the old view that a spiritual issue is the root cause of most (maybe even all) depression. This view insists that depression is directly caused by the sufferer’s sin and then the solution to depression rests in repentance. According to this perspective, pastors, elders, and regular believers, should call depression-sufferers to determine the sin which caused their anguish and turn from it. Thankfully, other voices have been bringing a more balanced view. Among them is Dr. David Murray. His excellent book Christians Get Depressed Too (review here) proceeds on the basis that depression is a complex phenomenon often involving biological and medical realities. One might think that this is a contemporary approach, something only developed in the last few years. However, Murray points out that a nuanced view of clinical depression has been around for hundreds of years. William Perkins (1558-1602) recognized that depression requires medical treatment, and so did Jonathan Edwards (1703-1758). Perkins and Edwards were not alone. I was recently paging through Peter Lewis’ The Genius of Puritanism. In chapter 3 (“The Puritan in Private”), Lewis has a discussion of mental depression. He notes that the Puritans distinguished spiritual depression (obviously caused by sin) from mental depression. They used the term “melancholy” for the latter. Lewis notes that Richard Baxter (1615-1691) and Thomas Brooks (1608-1680) both recognized melancholy as a medical phenomenon. I want to focus for a moment on Brooks and what he writes about this in The Crown and Glory of Christianity (found in volume 4 of The Complete Works of Thomas Brooks). Now there is no greater enemy to holy joy and gladness than melancholy, for this pestilent humour will raise such strange passions and imaginations, it will raise such groundless griefs, and fears, and frights, and such senseless surmises and jealousies, as will easily damp a Christian’s joy, and mightily vex, perplex, trouble, and turmoil, daunt, and discourage a Christian’s spirit (page 260). He further says that this inclination towards melancholy can be used by Satan to his advantage. Moreover, it is a condition which afflicts both soul and body. There is definitely a spiritual aspect to the experience of depression, according to Thomas Brooks. In another book, he writes that this malady “tries the physician, grieves the minister, wounds relations, and makes sport for the Devil.” This surely sounds familiar! Also familiar is the cure of which Brooks writes. He writes, “The cure of melancholy belongs rather to the physician than to the divine, to Galen than to Paul” (page 260). By “divine” here, Brooks means “theologian” or “pastor.” Galen (129-200 or 216) was one of the ancient pioneers of medical science. In our terms, Brooks was saying that depression needs to be treated by doctors, rather than by ministers. Certainly he would agree that ministers must be involved and can provide spiritual guidance as treatment is sought and provided, but at its roots this is a medical problem to be addressed by medical science. Did I mention that this was written in 1662? Yes, in those times they had a far different understanding of medical science, yet they were not averse to pinning a mood disorder on a biological cause. If you were to encounter a brother or sister suffering from a brain tumour, you would encourage them rather than admonish them to examine themselves for the sin which caused their condition. Of course, we hold each other accountable for how we respond to medical ailments. Every Christian is responsible for how they respond to adversity in whatever form. Clinical depression should be dealt with in the same way. Those suffering from it need medical treatment — and Christian encouragement from office bearers and regular church members. In so doing, we reflect the heart and compassion of our Saviour Jesus. Fluoxetine. Paxil. Celexa. Wellbutrin. Zoloft. If those words are familiar to you, this article may be for you. Even if those words aren’t familiar right now, someday they may be. They’re all names of popular anti-depressants. Depression is a widespread problem in our society today. In the United States, over 19 million adults are thought to suffer from it. On a per capita basis, things are not much different in Canada. Depression is often accompanied by suicidal feelings. Approximately 15% of all people who have been hospitalized for depression eventually succeed in taking their own lives. Today, if you or someone dear to you is suffering from depression, I want to bring you some good news. This good news comes from God’s Word, the Bible. You have to know: it’s not pie-in-the-sky idealism. This is real world stuff. The real God has a message of grace and hope for us when we’re in the middle of worst-case scenarios. I know because someone I love dearly has been there. My mom suffered from depression for many of her adult years. Having been sexually abused as a child and teenager, she had a difficult time coming to terms with the past. Various physical ailments only complicated her situation and made things that much worse. She was prescribed numerous medications. At the time of her passing, she was on approximately a dozen different drugs. My mom passed away too soon at the age of 56. She took her own life in 2002. She was suffering enormously with her depression and could see no way out. Maybe you or someone you know feels the same way today. You may have a hard time believing it, but there is someone who understands. A lot of times people who are depressed feel like there is no one who understands. People say a lot of trite things. They tell you to think positively. “Stop being so self-absorbed and negative!” They tell you to get out of bed and help somebody else. But you can’t. And they just don’t get it. They don’t get this deep dark pit that you’re in. …my soul is filled with troubles. And my life comes near the grave. I am added among those who go down into the deep hole. I am like a person without strength. You have taken my good friends far from me. You have made me hated by them. I am shut in and cannot go out. My eyes have become weak because of trouble. I have called to you, every day, O Lord. Wouldn’t you agree that this is somebody who understands where you’re at right now? Isn’t this somebody who knows what it’s like to be depressed, to be in the pit of despair? This is somebody who believes in God, yet he feels like God has abandoned him. It wasn’t because of some sin he’d done. It was just the way things were. He feels like God is distant, uncaring, emotionally removed from him. Even though those feelings may not accurately reflect reality, those feelings and emotions are raw and real for the one who is suffering. The Bible takes those feelings seriously! So, we can look in the Bible and find at least one person who understands where we’re at when we’re depressed. It’s a start, but it’s not really the answer we’re looking for, is it? After all, we could find a support group for other depressed people and get the same thing. Even though we feel like we suffer alone, the truth is that there are countless others around us who are depressed too. But imagine if those words from Psalm 88 were not just the words of a man. Imagine those words were the words of God. The grace of God for you today is that they are the words of God. The grace of God for you today is that they are the words of someone who was both God and man. You see, in the New Testament, one of the most quoted books is the book of Psalms. So often, the Psalms are coming out of the mouth of the Lord Jesus Christ or used to talk about him. It happens so often we can say that the Psalms are the songs of Jesus. When we know this, we can read Psalm 88 in a new way. Psalm 88 is the song of Jesus Christ. Not through any fault of his own, the Lord Jesus was the one abandoned by God. He cried out on the cross, using the words of Psalm 22, “My God, my God, why have you turned your back on me! ?” And not only God – all his friends and disciples abandoned him too. The Lord Jesus suffered with a rawness that we will never grasp. God poured out his anger against sin on Jesus Christ, so that everyone who holds on to Jesus with faith will be accepted by God as an adopted child. If you’re depressed, Jesus Christ knows what you are going through. If someone you know is depressed, Jesus understands. And he is the way in which God has given grace to us. Grace – being given something we don’t deserve – is God’s gift to us in Jesus Christ. We don’t deserve to have somebody who listens and understands. We don’t deserve to have a Saviour like the Lord Jesus. But God has mercy and compassion on us. God knows what you truly need at this moment. You need Jesus Christ. You need to call to him, the one who understands what you’re going through. Tell him how you feel. Tell him about your weaknesses and your sins. Ask him to lift it all away. You see, Jesus Christ came into this world to deal with sin and the consequences of sin. When Adam and Eve fell into sin at the beginning of the world, depression came along with it, along with cancer and hundreds of other ailments. Jesus Christ came to deal with it all. His victory through suffering is his gracious promise that someday we too will be entirely free of depression and other forms of suffering. Read the last chapters of the book of Revelation (the last book of the Bible) and you can see what waits for those who hold on to Jesus in faith. Yet, this present life is full of suffering. Sometimes it can be confusing. This is especially so when suicide comes into the picture. If you’re feeling suicidal right now or ever feel that way, you need to talk with someone. Talk until something gets done about it. You need to find counselling. A good place to start would be your medical doctor or local hospital. And if someone you know is talking about taking their own life, please take it seriously. You need to find help for them. But it can and does happen that somebody takes their own life. What does God’s Word say to that? Some say there is no hope, no grace for such people. But this approach fails to see the depth of God’s grace in Jesus Christ. If someone says that they believe in Jesus Christ, and yet they become depressed, even to the point of taking their own life – that does not take away the grace of God for them! The Lord Jesus deals with all the sin in our lives. Not what we do, but Jesus Christ makes us right with God. Why would our eternal destiny be determined by the final act of our lives? When we believe, God’s grace in Jesus Christ is deep enough to cover every sin, even the sins done in the weakness of our final moments. Whether we’re depressed or know somebody who’s depressed, whether we’re suicidal or know somebody who has taken their own life, for all of us: there is God’s rich and deep grace in Jesus Christ. In Jesus Christ, there is someone who understands. In Jesus Christ, there is someone who promises to deal with your pain and suffering. In Jesus Christ, we have somebody who helps us to at least start making sense of a broken world. When we truly take hold of Jesus Christ and trust that he is the one who saves us from our offenses against God, our whole life, even when we are depressed has the potential to take on a new perspective. In conclusion, please consider Hebrews 4:14-16. This passage speaks about Jesus Christ as the great High Priest, he is the one who brings a sacrifice so our sins are dealt with and we can be right with God. Listen to God’s Word to you: “We have a great High Priest who has made the way for man to go to God. He is Jesus, the Son of God, who has gone to heaven to be with God. Let us keep our trust in Jesus Christ. Our High Priest understands how weak we are. Christ was tempted in every way we are tempted, but he did not sin. Let us go with complete trust to the throne of God. We will receive his grace and have his loving-favour to help us whenever we need it.” May God bless you with his grace in Jesus Christ! Dr. David Murray is rapidly becoming well-known. He blogs regularly (headhearthand.org), does a podcast with Tim Challies, is a regular Facebook user, video producer, and preacher. Besides all that, he finds time to teach Old Testament and Practical Theology at Puritan Theological Seminary, in Grand Rapids, Michigan. Murray has developed a reputation for being theologically astute, biblically faithful, and pastorally sensitive. All of those qualities come together in this short book on a tough subject. There is a perception out there that depression is, at its roots, a spiritual problem. According to this perception, people become depressed because they have done something sinful. 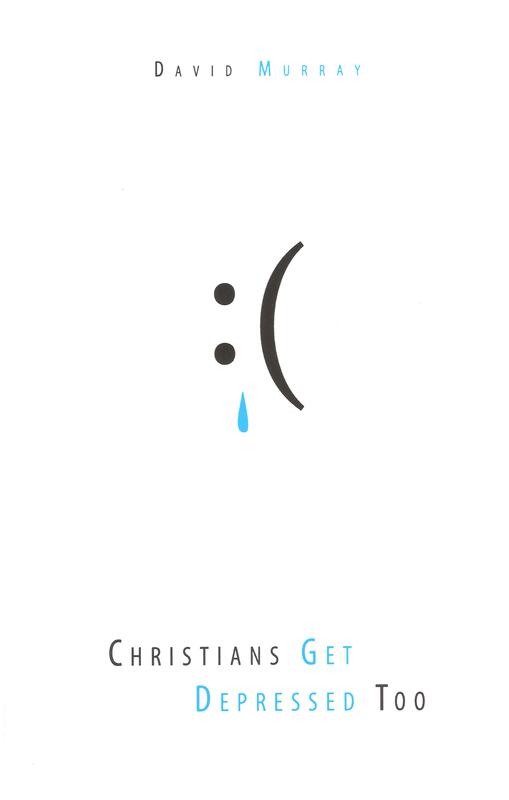 A true and faithful Christian would never get depressed. Part of Murray’s burden in this book is to dismantle that perception. He does that with an open Bible, explaining how godly believers in both Testaments struggled with this problem. The author goes on to outline how complex depression is – there are no trite and easy answers. He describes the problem in a way that will be helpful for those trying to understand it. He also gives hope, comfort, and help for those who are suffering. Again, all of this is grounded in the Word of God. Yes, Murray believes that Christians can learn from medical science and he attempts to incorporate some of those insights into this book. He is also firmly convinced that medication can not only alleviate symptoms, but also address the causes of depression in many cases. There are a lot of people out there who struggle with this ailment. In severe cases, it can be debilitating. It’s hard to know what to say or do if you’re watching someone go through it. Those who want to help should read this book. And don’t be afraid to buy a copy for the person suffering either. It may give the encouragement and help they need. The book is short enough so as not to be intimidating and written clearly enough so as not to be misunderstood. I’ve read and reviewed several books on this subject over the years. I’ve learned that depression is a dark and ugly consequence of the fall into sin. It is no less a part of this world of dysfunction than is cancer. At the same, I’ve learned (and Murray’s book has reinforced this) that depression reminds us of how little we know about the workings of the human brain and how it relates to our non-material aspect (our soul). Finally, I’ve become convinced that God brings trials (including depression) our way so as to shape, teach, and lead us. This little book brings us back to the Word through which that all happens. Ed Welch has written one of the best books on depression. In this video, he gives some of the background to his book. Depression: A Stubborn Darkness, Edward T. Welch, Winston-Salem: Vantage Point, 2004, softcover, 275 pages, $10.19 (from Amazon.com). Depression has been described as the common cold of mental illnesses. Many of us know people who chronically or periodically suffer with this ailment. Many of us ourselves suffer, often in silence. This being the case, it’s always good to know of some helpful resources that direct us back to God’s Word for the support and encouragement we need. This book by Ed Welch is one such resource that I can highly recommend. Ed Welch is the author of several helpful books, including When People are Big and God is Small. He is a professor of Practical Theology at Westminster Theological Seminary in Philadelphia and a counsellor, faculty member and director of the School of Biblical Counseling at the Christian Counseling and Educational Foundation. His years of experience both in counselling and in teaching the Scriptures are reflected in this volume. The book begins with a vivid description of what depression is and what it’s like to experience it. For those who live with depressed people, this will be enormously helpful. It’ll give you an idea of what your loved one is experiencing. From there, Welch goes on to describe the ways in which depression is suffering and how we’re to interpret that suffering in the light of the Bible. He examines what depression is saying to us and goes on to look at ways that the depressed person can be helped. Welch acknowledges the place of medication in treatment for depression, but he urges his readers to be circumspect. The book closes with some exhortations from Scripture to humility, hope, thankfulness and joy. Like his other books, this one is really devotional in character. Skilfully using the Word, Welch drives us to God and, more specifically, to Christ the Saviour. It is a long book, but the chapters (26 of them) are short enough to read in one sitting. There are a good deal many helpful insights in this book. This is not the “grin and bear it” brand of counselling, nor is it the brand that simply tells us that depression is a disease like cancer, a disease that might be helped solely by medical treatments. Welch’s approach is balanced and Biblical. All in all, when that stubborn darkness descends on you or someone you love, Ed Welch could be the one to bring the light of the Scriptures to bear with a good result.